Lemon Verbena takes citrus to a whole new level combining lemon zest and sweet verbena -- an elegantly sweet variation of the traditional lemony scent. Lemon Verbena is valued for its wonderfully light, mild citrus scent. 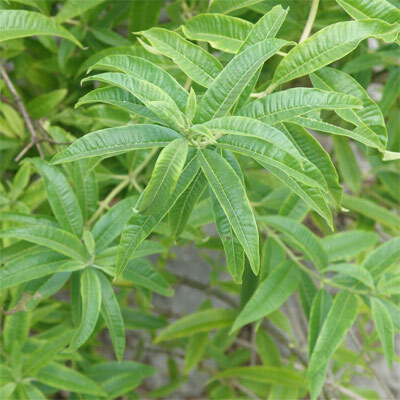 Lemon verbena leaves are used to add a lemon flavor to fish and poultry dishes, vegetable marinades, salad dressings, jams, puddings, Greek yogurt and beverages. It also is used to make herbal teas, or added to standard tea in place of actual lemon. Lemon verbena is a perennial shrub or subshrub growing to 2–3 m high. The 8 cm long glossy, pointed leaves are slightly rough to the touch and emit a powerful scent reminiscent of lemon when bruised (hence the Latin specific epithet citrodora - lemon-scented). Pregnancy and breast-feeding: Not enough is known about the use of lemon verbena during pregnancy and breast-feeding. Stay on the safe side and avoid use. Kidney disease: Large amounts of lemon verbena may irritate the kidneys and make kidney disease worse. Avoid using large amounts if you have kidney problems.